Electric Grills - View our range of Electric Grills here at Anthony Ryans cookware shop, offering excellent quality Electric Grills to suit your needs. 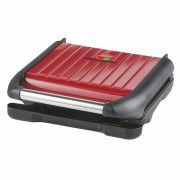 Electric health grills are a super buy for your kitchen delivering knock-out food quickly, easily and with less fat. 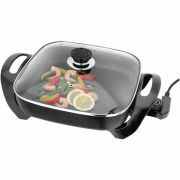 Grill plates heat top and bottom and are fitted with floating hinges to accommodate thicker foods. Ideal for meat cuts and for grilling vegetables, often cooking can be done in the one place all together. Generally non-stick for easier cooking and cleaning, using less if no cooking oil keeping meals lower in calories and fat. Riveted too, oil can drain away while cooking. George Foreman grills are the name sake when it comes to health grills but there are other choices on the market, which also pack a punch when cooking your food.